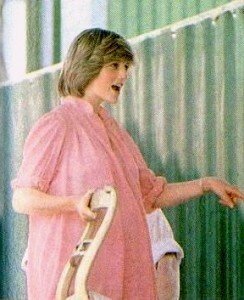 Princess Diana, shown here pregnant with Prince William, brought a human touch to the British royal family. Born July 1, 1961, at her childhood home, Park House on the royal family's Sandringham Estate in Norfolk, Lady Diana Spencer married Prince Charles, a longtime family friend, in a "fairy-tale wedding" in London in 1981, when she was 20. Prince William was born less than a year later. Prince Harry was born in 1984. Zillions of words have been written about the fascinating and ultimately tragic Princess Diana, who was separated from Prince Charles in 1992, and divorced in 1996. She died in a horrific automobile accident in 1997. Diana was known for her beauty and charisma, and for her unbridled affection for her children. Her foibles were visible even to a mostly adoring public, but she had warmth as well as sparkle. "In 1987, when so many still believed that AIDS could be contracted through casual contact, Princess Diana sat on the sickbed of a man with AIDS and held his hand. She showed the world that people with AIDS deserve no isolation, but compassion and kindness. It helped change world opinion, and gave hope to people with AIDS with an outcome of saved lives of people at risk." This entry was posted in A world view, History, Royal wedding and tagged AIDS, fairy-tale wedding, Lady Diana Spencer, Norfolk, Park House, President Bill Clinton, Prince Charles, Prince Harry, Prince William, Princess Diana, Sandringham Estate by Delia. Bookmark the permalink.